your new place in the sun! 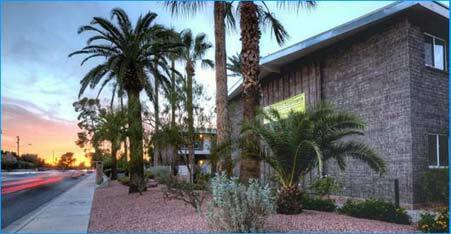 Bethany Palms is a premier mid-sized urban core apartment community in mid-town Phoenix. The property is a 22-unit garden-style apartment community that was completely renovated in 2012. Bethany Palms captures the essence of modern living and offers green eco-friendly features such as energy star appliances, water efficient fixtures and energy efficient lighting and windows. The property has a unit mix consisting of all two-bedroom, one and one half-bath floor plans that are approximately 987 square feet and are extremely well designed. All of the units have been renovated with polished concrete flooring, new stainless steel/butcher block countertops, modern Ikea cabinetry and bathroom vanities, premium lighting, brushed nickel fixtures and ceiling fans, new kitchen appliances and new dual pane windows. Exterior renovations include an attractive courtyard with a Pebble Tec swimming pool and a resort style grounds lined with mature trees and low water use plants. Additional community amenities include covered parking, a spacious on-site laundry facility. Located on Bethany Home Road less than a mile West of the Piestewa Peak Parkway (SR 51), Bethany Palms residents have convenient access to the Boutique Retails, Independent Restaurants, of the Camelback Corridor as well as to the Midtown and Downtown Phoenix employment corridors.